How many items can I print? Do I provide my own shirts? What is the best way to exchange information? I have a design idea, what's next? 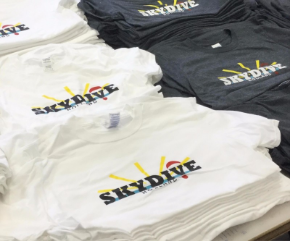 At SIGNWORKS, we can print almost any design that you can come up with on a wide variety of clothing from t-shirts and yoga pants to hoodies and coats. If you can dream it, we'll print it. Just send us a message and we'll see what we can do. We'll work with you to create the design you want. At SIGNWORKS, we can support orders of all sizes. If you have a small office and just need a handful of promotional shirts, or if you have a large order of thousands for a soccer club or school, we'll take care of it. We don't believe in minimums, everybody has different needs and we are here to fulfill them. No, you do not have to. We prefer to supply products to our customers so that we can ensure that they get the best quality and exactly what they want. Just let us know what type of item and what material you prefer and we can source it for you. We have several methods of communicating with our clients. Email, fax, phone, online file transfers (at our FTP site) and personal visits are all common practice in our business. It is important to us that we make it easy to do business and save you time! We absolutely do. We can deliver it directly to you, or if it happens to be far away we can coordinate shipping to get it to where it needs to be. Ideally, artwork sent in Vector, AI or EPS format is the best to minimize charges to you, and also makes it easier for us because we don't have to spend a lot of time digitizing your artwork. PDF, JPEG, PSD, CDR, PNG, DCS. File types that we don't suggest sending are: Microsoft Office, MS Word, Paint, or Powerpoint. At SIGNWORKS, we have talented designers on staff to help you create the artwork you want. We will collaborate with you to get the design exactly how you'd like it to be. Did you scheme up a cool clothing design but aren't sure what to do next? Send us a message with all of your information and we will work together to make your idea a reality. Just click the title above and it will take you right to our contact page.